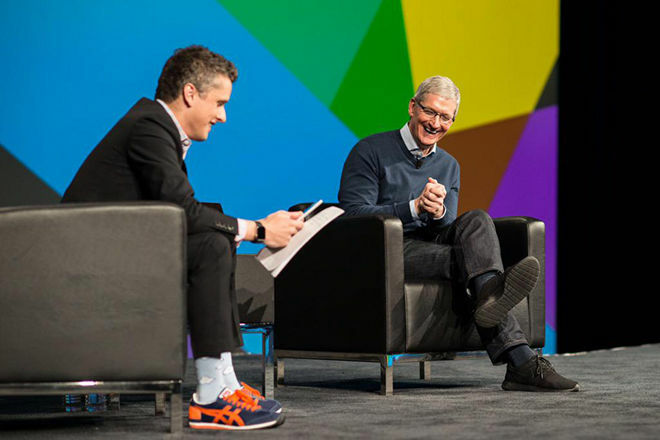 During an interview at the BoxWorks 2015 conference on Tuesday, Apple CEO Tim Cook revealed enterprise sales generated $25 billion over the past 12 months, or roughly 14 percent of the company's revenue for the trailing year. Cook dropped the number on Box CEO Aaron Levie during a one-on-one interview focusing on Apple's history, and future, in enterprise, reports USA Today. "If you look at the last 12 months, (enterprise sales were) $25 billion," Cook said. "This is not a hobby. This is a real business." After rising to a dominant position in the consumer space, Apple has bolstered its position in enterprise through strategic partnerships, including a tie-up with old rival IBM. Under the "MobileFirst for iOS" banner, IBM markets a wide range of business software solutions running natively on Apple hardware. The effort is even making inroads into education, another wellspring of revenue for Apple. "If you think back in time, Apple and IBM were foes. Apple and Microsoft were foes," Cook says. "But if you look at it, Microsoft and Apple can work on more things together. It is great for our customers. That is why we do it. I don't believe in grudges." Box, too, partnered with IBM in June, bringing its cloud collaboration smarts to products like MobileFirst for iOS. Box SVP of Product and Platform Chris Yeh told AppleInsider the first app offerings should hit market before year's end. As for Apple's future, enterprise represents a major area of potential growth, Cook said. Aside from its unified hardware and software ecosystem, a plus for business deployments, Apple needs to partner with companies already well established in vertical markets, as seen with IBM and Cisco. "We're in the early days of what we can do," Cook said. "My gosh, we haven't started yet."